Started in 2001 as AtTask, Workfront was founded by a small group of forward-thinking entrepreneurs dedicated to making better project management software. Over the following years, AtTask rose to prominence, ultimately expanding our platform to meet the unique work management challenges of enterprise organizations and changing their name to Workfront. Today, Workfront is the expert in unleashing enterprise teams’ value through greater collaboration, visibility, and velocity. Workfront came to GENCOMM™ as they were preparing to build and move their corporate headquarters in Lehi, UT. Workfront was looking for a new approach to their audio-visual systems in their new space. Their current systems seemed to work okay, but put a lot of strain on the IT department. Every room was a different system and functioned in different ways; this required IT staff to be present or available for most meetings since they were the only ones that knew how to run these systems. Having multiple TV displays throughout their office they had to go through and turn them all on every morning and off every afternoon, one-by-one. Digital signage was run with Mac Minis hidden above the celling of each display. Each time content had to be changed IT would get out a ladder and climb up to retrieve and replace the USB drive in the mac mini. GENCOMM™ listened to what Workfront wanted to accomplish and presented a networked audio-visual solution that would not only meet their needs, but also solve the issues they presented. 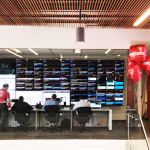 Being centralized, this system allows the IT team at Workfront to manage all the displays, content devices, and even the functions of each room, remotely. Being customized to their specific needs, Workfront now uses their technology to drive their culture and their growth. Workfront’s offices were designed with a variety of collaboration spaces from small huddle rooms to large training rooms. They even have an open collaboration space in the middle of the cubicle areas for instant idea sharing. Each of these spaces had unique needs relating to technology. The GENCOMM™ audio-visual system allows the teams within the Lehi office to collaborate with each other, those in other offices around the world, and their clients whenever they need and however they need. The simplicity and consistency of the system makes it possible for any employee to come use the spaces with little to no training; thus freeing up time to work on the thing Workfront is best at, innovation! While researching all the technology on the market, the Workfront team found all the traditional options available and had a difficult time figuring out why they were different and what would work best for them. Through the consultative process used at GENCOMM™, the team was able to point Workfront in a new direction that they had not researched. These new ideas were exactly what they were looking for and now have a scalable system that fosters rather than inhibits their rapid growth. Company culture is a big part of Workfront and critical to their success and growth. They wanted audio-visual technology that not only matched their culture but also helped drive it. Through the systems that GENCOMM™ built for Workfront, they are able to create employee engagement campaigns that keep their teams up-to-date and involved with the company. The IT team at Workfront would spend anywhere from 40-60% of their time on audio-visual issues or requests in their old systems. With the new, centrally managed, system Workfront IT staff has been able to reduce this to 5-10% of their time, with some IT staff not even touching audio-visual systems now. This has allowed the IT team to remain smaller as the company grows, but also has allowed them the time to focus on the IT-related tasks they were hired to do; keeping networks online, preventing cyber-attacks, maintaining phone systems, and so forth.